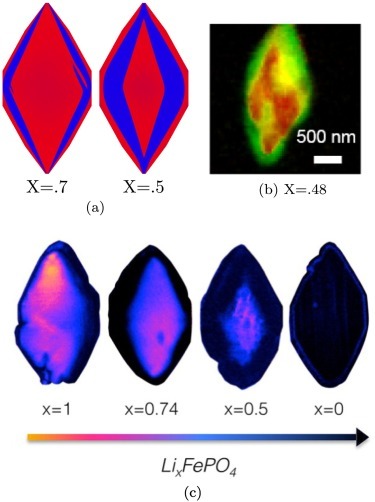 Comparison of (a) simulated and (b)-(c) observed lithiated diamond cores in LixFePO4 single particles. My postdoc with Prof. Martin Bazant officially ended 6 years ago, but it’s still generating research papers! A paper that we wrote was just published at Electrochemistry Communications, and is available for free at this link until October 28. Over that time we had been following the progress in advanced microscopy techniques applied to battery materials, and realized that our model of lithium iron phosphate captured many of the features researchers were imaging. The model helped resolve conflicting reports from different researchers who looked at a variety of different size LiFePO4 crystals. The smallest crystals at the nanoscale are controlled by their surface properties, while micron sized crystals are dominated by elastic energy. Just by running larger simulations we observed the transition that experimentalists were imaging. After a bunch of time invested on nights and weekends, this paper is finally finished. I recently had a paper accepted at the Journal of Computational Physics on removing timestep restrictions in the numerical solution of two-phase flow problems in porous media. The paper can be downloaded for free from the journal until August 23rd by following this link. The idea is to add some carefully constructed phase-field terms that guarantee Newton’s method will converge. This changes the physics a little bit, but a solution to the original equations can be found by reducing the magnitude of these terms to zero over a few Newton updates. Progression of the homotopy solution during one timestep with a very large dt. Although the major findings in this work were accomplished by experimental collaborators at Stanford and LBNL, the motivation for the experiments came in part from my postdoc work, where we simulated the heterogeneity of lithium in battery nanoparticles and made several controversial predictions. We calculated that the properties of individual nanoparticles should be significantly different from the measured properties of battery electrodes, which are comprised of billions of particles. Thus the challenge was to build a battery out of a single nanoparticle and measure its properties. It took several years, but this paper conclusively verifies the prediction of a heterogeneous reaction rate in LiFePO4 with a beautiful set of experiments. Our colleagues at Stanford made a rechargeable battery out of a few nanoparticles, and invented a way to image the chemical composition of the particles as they were cycled in a liquid electrolyte (inside a synchrotron). Below is the first ever video of LiFePO4 nanoparticles being charged and discharged.